Bloomex is proud to announce a brand new partnership with Canada Running Series! We are delighted to be working with another national partner dedicated to improving fitness and community enjoyment for Canadians, as well as helping raise massive dollars for charities. Canada Running Series [CRS] is the nation's premier running circuit with 8 events: 4 in Toronto, 3 in Vancouver and 1 in Montreal. It annually attracts some 60,000 participants and raises more than $5 million for some 250 mostly-local charities. For three decades CRS has been passionately committed to building community through running - to building a better Toronto, a better Vancouver, a better Montreal, a better Canada. Their vision has been to build complete, big-city races that welcome everyone, from Olympians to healthy-lifestyle enthusiasts to charity runners. CRS events are built on the twin pillars of organization and innovation, to provide outstanding, unforgettable running experiences. Driven by these commitments, CRS has grown into a turnkey, national, year-round program that offers exceptional value to all involved. Bloomex is the largest florist in Canada, with 8 production centres coast to coast and a similar goal of supporting community and charity, while celebrating the meaningful occasions that mark our lives. "Bloomex is happy to partner with the CRS and provide beautiful medallist bouquets, fresh floral arrangements and gourmet gift baskets to enhance the race experience for all participants," says Mark Campaugh, Bloomex Director of Marketing. "We look forward to working with CRS and having fun at all the races." “We're delighted to welcome Bloomex to the CRS community. CRS is about joy, achievement and celebration -- what better way to say this than with flowers!” - Alan Brookes, Race Director, Canada Running Series. offers runners a chance to follow a scenic 5k or 10k loop through the Toronto Zoo grounds on September 12. The popular, family-friendly event also offers a “Cub Run” event & costume contest for kids. Bloomex will also be providing the flowers and gift baskets for the always-enjoyable Vancouver Eastside 10k on September 19. This run takes runners through the historic east side of Vancouver, including parts of Gastown, Chinatown, and East Vancouver—parts of the city that are rarely closed to traffic. And finally, Bloomex is the official florist for the prestigious Scotiabank Toronto Waterfront Marathon on October 18. This event is the Grand Finale and signature event of the Canada Running Series. This race attracts a large field of over 25,000 runners each year as Canada’s #1 big-city marathon. In addition to holding a prestigious IAAF Gold Label, it will also serve as host of the 2015 Canadian National Marathon Championships. For more information on these races and those in 2016, including race entry forms, hotel information, social networking, and charity information, please visit the CRS website. 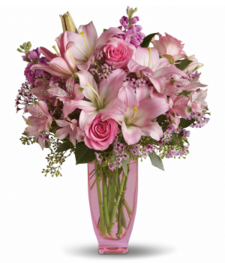 To order flowers to cheer on or congratulate a race participant, please visit the Bloomex website. We hope to see you at one (or all) of these amazing events!